Here we are in March, baby. Grab yourself some cabbage. Why cabbage? It stores well so when the rest of the vegetables are long gone, cabbage is still fresh enough to use. I lived in the desert in Mexico for a month, and the food stores always had cabbage. Lettuce was impossible to find because they lacked refrigeration. Here in the North East, the only “in season” food left is potatoes, turnips, and cabbage. Yum! So, it is time for our recipe swap. In April, we get to move onto asparagus and strawberries in May, but now we are stuck with cabbage. There are so many things to do with it. You can make soup, coleslaw, kimchee, and braise it. I was not very creative this month and did a “boiled” dinner because I happen to love it. Corned beef is salt-cured for storage and can be found next to the ham in the meat section of your supermarket. All you have to do to prepare it is boil it for hours to render it tender. My recipe features 4 pounds of vegetables and 2 pounds of meat to attempt to make it healthier. It is only an attempt, because corned beef is both fatty and salty. It has a whopping 938 mg of sodium and 14.7 grams of fat per 3 ounce serving, so this is definitely a treat. I eat a wee bit of corned beef and lots of potatoes, cabbage, and carrots which have been cooked in the meaty juice for a nice flavor. The slow cooker is the perfect device for corned beef since you don’t have to watch it. You add the cabbage in at the end so it doesn’t become a pile of mush. 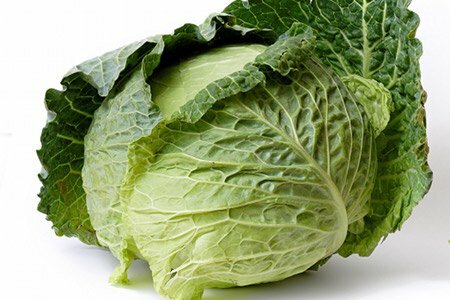 Please share your healthier cabbage recipes. In a 6-quart slow cooker, mix carrots and potatoes. Place corned beef on top of vegetables and pour in beer (optional) and water to mostly cover meat. Set cooker on low for 8 hours. After 7 hours, use a slotted spoon to remove potatoes and carrots. Add cabbage and cook for the final hour. Slice the corned beef across the grain and serve with mustard. Love the tast of cabbage with potatoes. Husband has high blood pressure, so will probably just get a 1/4 inch slice from the deli and chop up in pieces and add as he likes his meat. I like using bags of shredded coleslaw (the kind with carrots, etc) because it's so convenient. I make a fairly traditional coleslaw (with light mayo, vinegar or lemon juice, and sugar or other sweetener), but my family traditionally adds drained crushed pineapple. I also have made it with diced apple, which kind of makes it a little Waldorf Salad-like. I also have experimented recently with other dressings on the bagged coleslaw. It's great for an Asian chicken salad, with green onion, slivered almonds, etc and a dressing like Newman's Own Light Sesame Ginger. I also tried a good blue cheese coleslaw recipe recently with 1 part water, 1 part light mayo, and 1 part light blue cheese dressing, plus bacon bits, sliced cherry tomato, and green onion. Bagged shredded cabbage is also a convenient addition to a stirfry. FYI making your own corned beef is not hard. It took me a couple of tries, to really get it down, but all attempts were delicious. I like the DIY method because store bought is expensive and there is always a lot of fat. Buying roasts that are marked down help the wallet and the waist. Thanks for all the great ideas. Pour tomato sauce and 2 additional cans of water in pot and start heating. Mix together meat and rice. Form into meatballs and add to sauce. Cook for ½ hour. Add coarsely chopped cabbage, brown sugar and juice of ½ lemon. Cook for approximately 1 ½ hours or until cabbage soft and meat done. A traditional Lithuanian cabbage soup recipe with pork: Take a 3 lb lean pork roast, wash, trim off fat, put in large pot with l large can puree or canned stewed tomatoes. (If tomatoes are whole, squish against side of pot with spoon to break apart.) Add 1/3 pot of water, some salt and pepper to taste. Bring to a boil and simmer, covered 2 hours. In saute pan, saute one large minced onion in small amount of oil til golden. Chop one head of cabbage. Add with sauteed onion to the pot. Add 2 + Tablespoons vinegar. Cook one-half hour, or until cabbage is done. So serve - remove pork, cut into chops, serve in bowl with cabbage soup. Good with dark rye bread and butter. Really hearty for a winter's meal! Sounds delish and perfect since St. Patty's Day is right around the corner! This is the St. Paddy's dish you're really looking for. I'm Irish. More Kale!!!!!! Boil potatoes without skins (any kind, any large amount). Drain. In same pot, roughly mash with a hand masher (not mixer) with ample salt and pepper and milk. Remove to side bowl, cover with foil. Slice 1 big bunch of kale and one small head of napa cabbage into ribbons. Chop up several nice slices of your corned beef and add to the onion/kale/cabbage, stirring to distribute. Taste for seasoning. Add your rustic mashed potatoes to the cabbage pot and mix all together. Pour yourself a Guinness and may I add, Slainte!!!! One way I like savoy cabbage is boiled with fattening non-organic corned beef [I haven't see an organic one yet :)]. That said, I haven't had this dish for over 3 yrs and this is the year I'm taking the risk! I boil the c beef for 1.5hrs, remove it to an oven-safe dish, baste it with a mixture of o.j., brown sugar and bourbon every 15mins at 350 for 1.5hrs; during last half hr I put cabbage wedges and carrots into c beef water [with its spices]. The c beef comes out shiny, browned and yummy sliced thinly on rye bread with a good mustard! I know this is not healthy but every so often I cave in to some nostalgic comfort food. The cabbage I drizzle with apple cider vinegar, my german grandmother's style. I also associate good cabbage cooked with another verboten meat--kielbasa!! [fresh from a polish deli] In a large oven crock fill with shredded cabbage, top with a grated carrot or 2, a tbsp of brown sugar and a circle of kielbasa, bake untouched til kielbasa splits and spills all its goodness over the now wilted cabbage; it looks pretty on a serving platter with home-baked beans and/or brown bread [baked in coffee can]. Again a very rare treat that emanates from my polish roots. But my new healthy way to get my fill of cabbage is through Eden's organic sauerkraut which I do enjoy at least weekly! I make a potato cabbage soup that is just potatoes (peeled or not) boiled with cabbage added for the last 15-20 minutes along with some olive oil, salt and pepper. My family likes it when I add some cooked chicken or turkey sausage to the bowl and I like it with a small piece of strong cheese (extra sharp cheddar or a robust Gouda). Anne, as an American who knows better, I'd like to apologize for my fellow-countrymen and -women who persist in misrendering it as "St. Patty's Day". A few of us do know the correct spelling, short for Padraig. This sounds like a great brisket slow-cooker meal. I like the idea of adding a little beer. I'm half Hungarian and love to make kielbasa, cabbage and turnip stew.